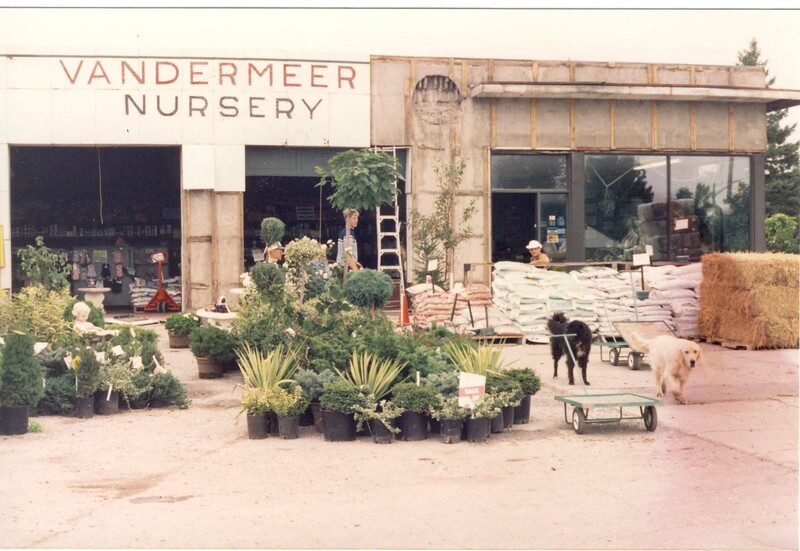 Our History – Vandermeer Nursery Ltd. Expanding our greenhouses over three generations. Growing up in Monster, Holland, Adrian Vandermeer was first exposed to the greenhouse industry through his father. Together, the family grew vegetables, tomatoes, and grapes, which were transported by boat and sold daily at the market in the neighbouring village of Poeldijk. When he was 15, Adrian began attending night school to learn about the growing process while working full time during the day for his father. In 1953, at 20 years old, Adrian came to Canada by boat for the first time with his brother Peter, arriving in Halifax, NS. Over the next 8 years, they worked in Quebec picking tobacco and chopping lumber while saving their money (earning 50¢ an hour) and learning English. At the age of 28, Adrian returned to Holland to visit his family and his sweetheart, Reit, whom he married in June 1960. They spent their honeymoon on the boat back to Canada, where they settled in the small town of Ajax, ON. While half of their savings went to the purchase of their first home on Lakeridge Road, the other half when towards the construction of the first greenhouse on their one-acre property. This greenhouse was built by Adrian himself with entirely scrap wood as that was all they could afford, measured 80’x50’, cost a total of $3500. Adrian grew tomatoes the first year and then decided to switch to flowers for the following year. Two years after the completion of the greenhouse, it was torn down and rebuilt using new lumber and glass. The second portion of the greenhouse, measuring 100’x60’, was added on later. Additional structures, similar to lean-tos, were built along the side of the greenhouse by Adrian and his children to increase growing space during the warmer months. Throughout these years, Adrian simultaneously worked the assembly line at the GM plant in Oshawa to support his growing family, until he quit in 1971 to focus on his business and help at home with the children. In 1976, he purchased a closed gas station that neighboured his property to be used as a retail store and incorporated Vandermeer Nursery. Years later, in 1988, Vandermeer Nursery expanded their business by renting eight more acres from a neighbour and constructing multiple temporary greenhouses for production purposes. It was at this time that the next generation, Adrian’s children, began to join the company. The original greenhouse was then rebuilt for the second time, measuring 84’x228’, and this makes up the majority of the retail store today. Simultaneously, four permanent plastic greenhouses were built, and production shifted into these, as well as a neighbour’s rented greenhouse. This allowed for most of the temporary greenhouses to be torn down. In 2000, another eight adjoining acres were purchased, and a much larger, glass production greenhouse was built over the course of two years. It measures 252’x504’ and provides over 120 000ft2. In the following years, two more additions were added onto the store to allow for more retail space and in 2005, the rented land was finally purchased by Vandermeer Nursery. In more recent years, the Ajax farmer’s market was hosted in the parking lot until road construction by the town on both Lakeridge Road and Bayly Road made it difficult to manage. Subsequently, the road work led to major construction by Vandermeer Nursery in 2014. The entrances were moved, the outdoor retail yard was expanded, new signs and gardens were built, and all water drainage under both the parking lot and the yard were reworked. With the addition of a large water filtration system in the production house, Vandermeer Nursery began recycling and reusing the majority of the water that is captured on the property. The following year, the retail yard was interlocked. Most recently, in June 2016, another adjoining property was purchased, adding 16 acres to the company, giving Vandermeer Nursery a total of 36 acres and almost 200 000ft2 of permanent greenhouse space spread over 7 buildings. The third generation has also begun to join the business and continue to contribute new ideas and paths upon which Vandermeer Nursery can grow.